The beautiful architectural centre of Arequipa, Peru. Although only an overnight bus north-west of Cusco, the second largest city in Peru offers a balanced, warmer climate and is a regular stop for travellers making their way through the southern part of the country. 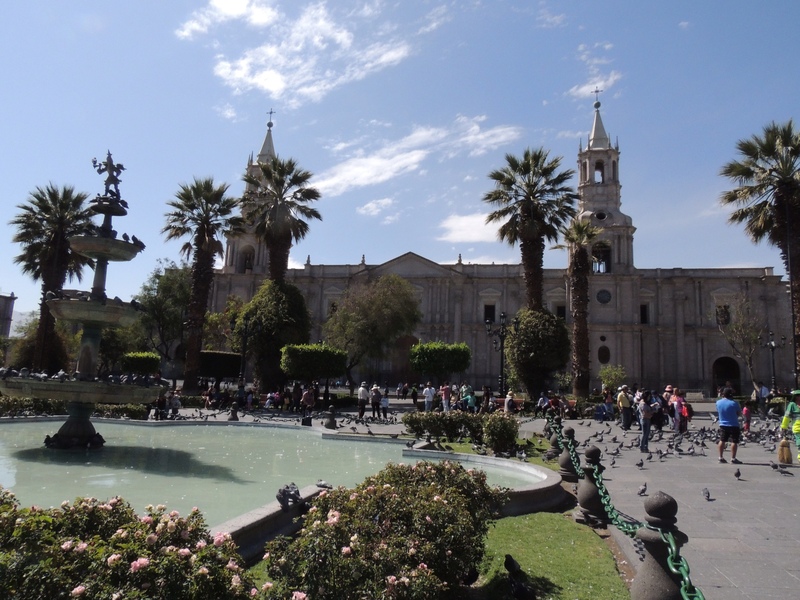 Arequipa has a pleasant charm and slightly more authentic feel than Cusco, its inhabitants pride themselves on their city's rich colonial history and economic importance, thus the city is clean, well preserved and tourist-friendly. After ten days of trekking and two equally exhausting days of fiestas in Cusco this was exactly the place I was looking for. I tentatively checked in to the Wild Rover hostel, one of a chain of Irish-owned hostels known for their backpacker party atmospheres, and was pleasantly surprised to find a relaxed courtyard around an ice-cold swimming pool. The crowd at the hostel were equally tranquilo, which was a relief after the endless supply of obnoxious Aussies I'd encountered the week before. The market is one of the biggest, most organised and among the cleanest I have seen in the whole of South America so far. The endless aisles on the bottom level are organised into every imaginable category – if you want something, you'll find it here. Upstairs there is a small comedor which offers traditional Peruvian food at a fraction of the price you'll find it elsewhere. Don't miss the Rocoto Relleno (stuffed peppers) or Chicharron (deep fried pork pieces). The free walking tour, by FWT Perú was interesting and personable, without the crowds that we had in Cusco. Again, you are treated to a gastronomic tour and you learn a little more about different places in the city as you make your way around. I recommend seeing it on the first day and using it to plan other places to visit during your stay. 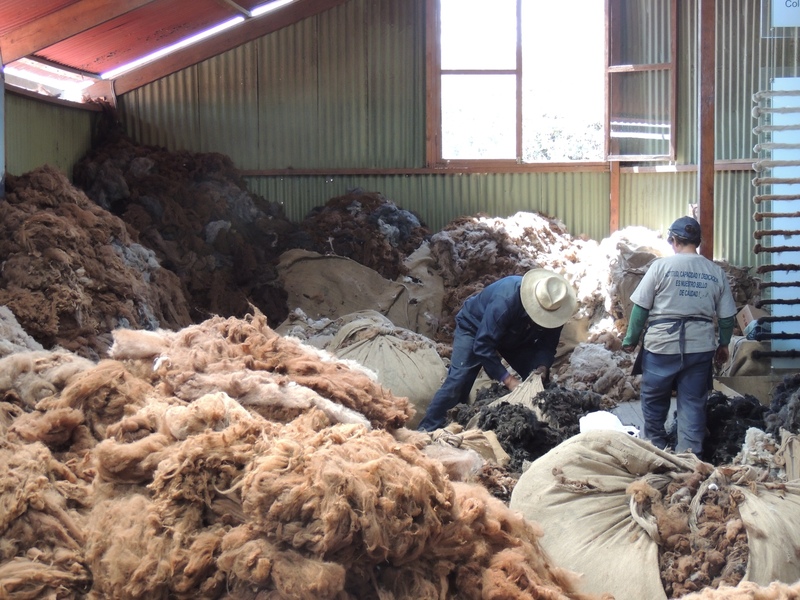 A stop at the Alpaca wool factory on the Arequipa FWT. 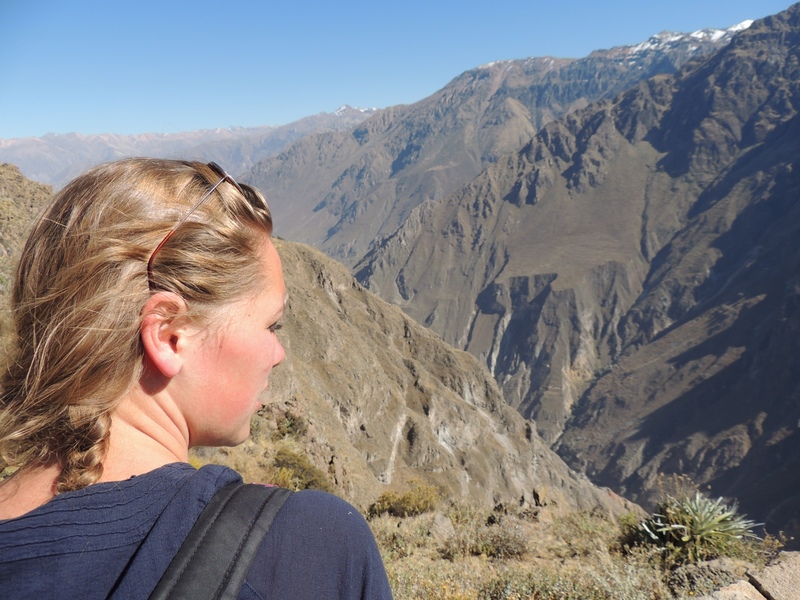 Another major drawcard is the city's proximity to the Colca Canyon, located about 150 kilometres further northwest of Arequipa. It is Peru's third most visited tourist attraction, with 120,000 visitors per year arriving to watch the Andean Condors and gaze into the 13,650ft depths, over twice those of the Grand Canyon in the United States. For me, it was the awesome remains of ancient terracing in and between the towns that were the most impressive. The majority of visitors opt for the tour option to visit the canyon, which is relatively inexpensive for someone on a moderate budget – expect to pay about 160 Soles (~$60AUD) for an all-inclusive one and a half day tour. Looking over the Cruz Del Condor, a popular mirador for viewing Andean Condors. The other option is to do it yourself, which is I chose for a few reasons. Firstly, buses from Arequipa to the starting town of Chivay are inexpensive and easy to organise. Accommodation in and around the canyon is super cheap, as little as 10 Soles a night and, as I've said before, breaking away from the inflexibility of a tour can be a great way to build your own adventure. The fact that I also had two tall blonde Dutch girls wanting to come with me had absolutely no bearing on my decision. Here are my directions and budget tips for seeing the canyon in three days, or more if desired. Go to a tour company, sweet talk them into giving you a map of the towns dotted along the canyon. Take a mid-morning bus from Arequipa to Chivay, approximately 5 hours and between 15-17 Soles, which should leave you enough time in the evening to explore the quaint town and enjoy some local cuisine.the are also natural hot springs, La Calera, to enjoy. An early start. Take either the 5am or 7am bus from the Chivay terminal (double check these times the day before!) to the Cruz Del Condor. The earlier you arrive at this mirador, the less crowded it will be. Here you will have a chance to see Andean Condors circling up from almost depths of almost 4,000ft. Then bus, hitchhike (20mins) or walk (2 hours) to Cabanaconde, the starting point for the main trails descending into the canyon. From here, we chose to take the trail to Sangalle (2-3 hour descent, depending on physical fitness), a picturesque oasis with several small tourist resorts. There is nowhere to buy food down here except at the hostels, 10 Soles per night for accommodation and the same price per two course meal. Depending on time limitations, you can choose to hike further into the canyon from here to spend another night at the bottom, or climb back up to Cabanaconde. Starting early, 5am at the latest, means you can take a same day bus back to Arequipa for the same return price. Deciding to do it this way saved us around 50 Soles each. When you put it in perspective, that's a few beers or a very nice Peruvian meal, well worth the saving. We also had the satisfaction of having done the tour ourselves and the freedom to move when and where we wanted to. Don't forget to check out resources like Wikitravel, and Google other blog pages like this one for planning inspiration, there are plenty of other travellers out there with great advice to share! ← Heading Back to Machu Picchu: The Salkantay Trek. no bearing at all you say? 😉 that’s great that you did it on your own! i went with a tour company back in 2009, but then again I was only on a 2 week holiday. If I ever head back down that way I’ll be sure to use this as my guide to Colca. Heaps of other guides out there too, mate!